CANCELATION FEE: guaranteed reservation can be cancelled withoutcharge until 12:00 on the arrival day. In case of no-show or failedcancellation first night room rate and VAT will be charged. In case of early departure,the confirmed rate of the day will be charged. Romantic hotel is unique hotel, which has two different parts: 4 stars - business and 3 stars - budget part. We seek to offer the various rooms and various prices for our clients according to they wishes and opportunities. We are trying to increase a tourism in Lithuania and in Panevezys. Romantic hotel is located in the city center of Panevezys, in the halfway of Lithuania and Latvia capitals Vilnius and Riga. 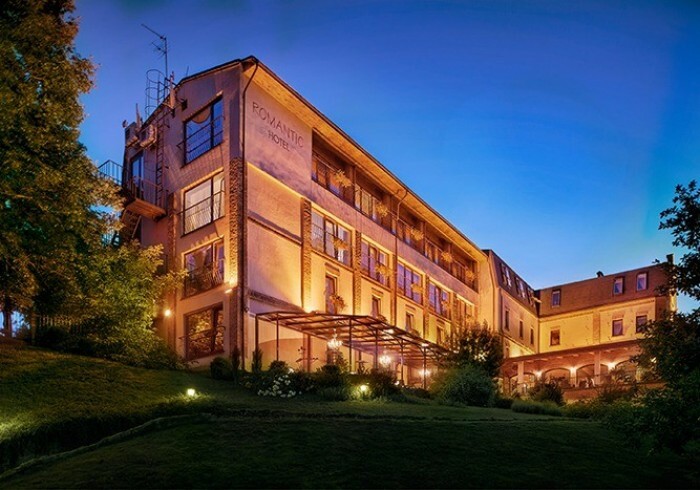 Hotel Romantic was built in 2002 in a historical mechanical flourmill and renovated in 2011. The front desk staff, available 24 hours a day, will provide laundry and dry cleaning services. There is an elevator to ensure guests comfort. Restaurant “Déjà vu”, which offers a wide selection of wine and international dishes – is a paradise for gourmets. An exclusive, order-consuming terrace is a perfect place for a little peace of mind. A fitness center is provided with a wide range of stimulators, sauna, turkish bath, jacuzzi and a pool of 25 m length. The pride of Hotel - ETNO-SPA - offers various massages, herbal or milk baths, hop, beer or barley – water baths, foot treatment baths, body scrubs and masks, recreation in hay beds while drinking herbal tea.